You will write an informal, magazine-style editorial or column piece in which you state your opinion(s) on a certain topic related to monsters/monstrosity and support this thesis. Essentially, this is a persuasive argument; you will try to convince your reader that your opinion is valid and/or correct. You may include the opinions of non-experts as long as they are in the context of evaluating the average person’s knowledge or opinion on a subject. You may not interview a non-expert and treat their opinion as fact, nor will the non-expert’s opinion count towards your minimum sources. “Nice guys finish last…” is a cliché term many people have heard before through a movie, reading or just overhearing it someday. The same may also be said for so-called good monsters of the monster universe. A question I had to ask myself was, if you pit monster vs. monster, which one(s) will have the edge at connecting to the hearts and minds of the people? The truth may very well be that the more evil the monster itself, the more memorable they become to individuals and this magazine essay explores a few instances of this. The people of the world seem to have a need for evil monsters in their lives and have enjoyed a close relationship with mankind since the dawn of civilizations, this being one of the reasons evil monsters have become so memorable for us. This relationship of evil monsters and people has been shown through paintings, pictures, sculpted art, sketches, and in literary forms from early and ancient civilizations. Author David Gilmore explains “monsters have a critical and fundamental role to play in the rise of civilization itself, not only in Europe and the Middle East, but everywhere” (Gilmore 26). Thinking of a popular evil monster, I think of the Sphinx, a half-man half lion. This monster is commonly associated with the Egyptian Pyramids and is one of the most memorable monsters of all time. Some folks may be surprised to know this monster wasn’t a friendly monster at all, but rather “dangerous or hostile to man, gratuitously one may say, often quite lethal” (Gilmore 27). Early societies relied upon these monsters, in part, to help explain events and occurrences happening in their times. Taking into the account the fact that evil monsters have been around since even the beginning of some civilizations, it is no wonder why evil monsters are even more popular and memorable than ever before. These two monsters are not even close to matching the popularity and memorability to the rest of their evil monster-peers, even when combining both of their worldwide searches (tens of thousands vs. hundreds of thousands). Both of these monsters instill fear in others around them due to their superhuman strength and appearance, amongst other attributes. The mentioned monsters, however, also share similarities and have a good side to them. These monsters feel compassion. For this reason, they are the lone soldiers at the bottom of the list. I am certainly not discrediting these great monsters, just elaborating on the bigger picture that evil monsters win the hearts of individuals. As one jumps up the list we can see some notable monsters, with Joker and Darth Vader taking the top spots. So what makes Joker more memorable in this case than Darth Vader? They both are killers, but the Jokers visual appearance is more similar to humans, thus it may become easier for the general population to take interest in the evil traits of the monster. Thinking of why it is easier for people to acquire interest in evil monsters, we can look at the psychology attribute of the subject. Psychology has played a role in the way humans have acquired interest in evil monsters, in particular. Going back to the memorability/popularity of an evil monster, Joker, an audience will immediately notice his character has a smile on his face, similar to that of a clown. As mentioned in the Journal of General Psychology, the use of humor towards something typically considered dangerous may induce “. . . desensitization of fear or ambivalence toward a dangerous product” (Ventis, Higbee and Murdock). In addition to joking around often and not taking himself very seriously, the joker shows a general disregard to seriousness even when committing heinous acts. Although, this monster is a villain, he uses humor to ease others fears of accepting and trusting him. This concurs with the general findings in the study that use of “humor can facilitate change in an emotional response tendency like fear” (Ventis, Higbee and Murdock). Connecting the dots, an audience will see the use of humor in the monsters character may have desensitized people enough to the point where his popularity now is on the rise. It is safe to say, Joker has not always been a popular character, given that he is evil, but has made a comeback, even rivaling the good superhero that made him famous, Humor makes the evil monsters like Joker much more appealing to audiences and increases their own popularity or likelihood of being memorable and/or made popular. Focusing more on desensitization in our culture and monsters/monstrosity, there is a definitive trend allowing evil monsters to become more acceptable as well as memorable in our society. Monsters, particularly the evil and villainous ones, are becoming easier for people to like, enjoy, and even look up to, in part due to the amount of exposure monsters are receiving through various mediums and forms. Want to keep in touch with your evil monster daily? Check out their Facebook and Twitter accounts! With “1.11 billion monthly active users as of March 2013” (Facebook) social media sites are certainly making it easier for general population to connect with evil monsters and have real impact on the popularity and memorability of that monster. 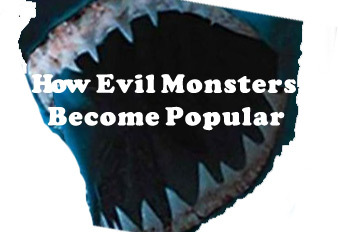 The popularity and memorability of evil monsters is on the rise everywhere and we find them in our restaurants, food, advertisements, toys, games and more. A visit to your local McDonald’s and you may see the newest popular monstrous toy out for kids, or flip on your TV or internet and you’ll see advertisements for the next horror story or ghost hunting episodes. The past decade has seen an explosion of famously evil monsters coming to life or back-to life on the big screen, such as Chucky, Darth Vader, Freddy vs. Jason, Hannibal, Hellraiser and the Minotaur (IMDB). We also see the exposure in all age groups to evil monsters through modern video games, including some notables like the Resident Evil, Mortal Kombat and Elder Scrolls series of monsters. New and old forms of media have helped sustain, spread and grow the memorability of evil monsters keeping the monsters surviving through to the next generation of mankind. The general population has accepted monsters and they have become engrained in our societies. Evil monsters have d played roles as some of the most memorable and reliable entities mankind has lived with since the earliest times. These monsters are alive and well with the people as seen in our entertainment, past history, ancient cultures, search trends, and even slipping into our lives subtly by psychological means. Evil monsters take on all types of forms and range from the not-so-bad to the not-so-good, the latter being available with increasing abundance. Take time to write down or think of a few of your favorite monsters of all time and your answers may just surprise you! How many of your favorite monsters are considered evil? Adwords, Google. Google Keywords Tool. 2013. Web. 23 April 2013. www.google.com. Gilmore, David D. Monsters: Evil Beings, Mythical Beasts, and All Manner of Imaginary Terrors. Philadelphia: University of Pennsylvania Press, 1943. Book. IMDB. Various Pages. n.d. Web. 23 April 2013. Swamp Thing. Dir. Wes Craven. Perf. Louis Jourdan and Adrienne Barbeau. 1982. Film. 09 April 2013. .
Trends, Google Search. 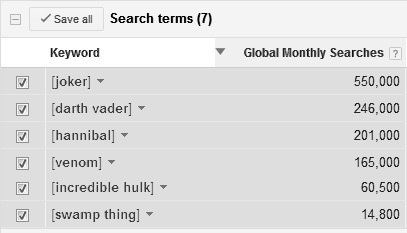 Web Search Interest: darth vader, hannibal, joker, incredible hulk, swamp thing. Worldwide, Jan 2004 – Jan 2013. 01 Janurary 2004-2013. Web. 03 May 2013. Ventis, Larry W, Garrett Higbee and Susan A Murdock. “Using Humor in Systematic Desensitization to Reduce Fear.” Journal Of General Psychology 128.2 (2001): 13. Document. 28 April 2013. web.ebscohost.com.